The fire on board of mega container ship CCNI Arauco is not yet extinguished. 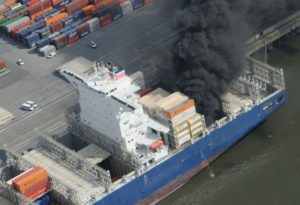 The burning containers are still smuggling and thick smoke continue to cover the vessel and container terminal in Hamburg. The three firefighting tugs stopped pouring the water over the aft section of the container ship, because cargo hold was flooded with 5,000 cbm, which cause problems for stability. The local authorities will start using fire extinguishing foam or to seal the hold and filling it with CO2 gas. It is not yet clear how the firefighting will continue, due to immediate danger for the ship’s stability and strength. 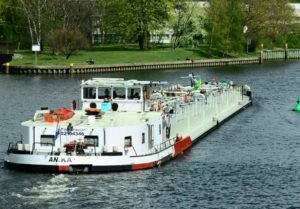 The local authorities decided to fill the hold with water up to 70% of its volume, though there’s the risk, that hull may crack, due to thermal differential. The temperature in the cargo hold is too high, which make impossible to offload the smuggling containers. The high temperature may cause cracking of the vessel’s hull or other damages. The containers in the cargo hold, as well as aft deck might be considered as total loss, but further assessment will be done after complete extinguishing of the flames. According to company’s information the total value of the cargo on board of container ship CCNI Arauco is around 700 million EUR.